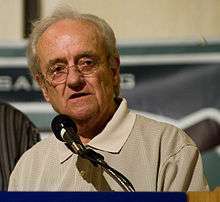 Roland Hemond (born October 26, 1929 in Central Falls, Rhode Island) is a longtime executive in Major League Baseball who in 2007 returned to the Arizona Diamondbacks as special assistant to the president. His previous positions include stints as scouting director of the California Angels, general manager of the Chicago White Sox, Baltimore Orioles, senior executive vice president of the Arizona Diamondbacks, and executive advisor to the general manager of the White Sox (2001–07). Hemond earned a World Series ring from his time as the assistant scouting director of the 1957 Milwaukee Braves. He was also the scouting director for the California Angels from 1961 to 1970. He served as general manager of the Chicago White Sox from 1970 to 1985 and held the same role for the Baltimore Orioles from 1988 to 1995. From 1996 to 2000, he was the senior executive vice president of the Arizona Diamondbacks. He returned to the White Sox between 2001 and 2007 as an executive advisor. He is also credited with the original idea for the Arizona Fall League, an off-season developmental league owned and operated by Major League Baseball. The league features the top prospects from each of the MLB teams, with all games played in the spring training stadiums in and around Phoenix, Arizona. He is the president of the Association of Professional Baseball Players of America (APBPA). This non-profit based in Southern California provides anonymous financial assistance and college scholarships to current and former players, scouts, and others connected with any level of professional organized baseball. During the 2006 World Series, four of Hemond's associates took part as the general managers and managers of the St. Louis Cardinals and Detroit Tigers. Walt Jocketty, the Cardinals GM, had served as the GM of the White Sox triple A affiliate, the Iowa Oaks. Cardinals manager Tony LaRussa was the White Sox field manager, and Tigers manager Jim Leyland was his third base coach. Tigers GM Dave Dombrowski was the White Sox assistant general manager. Hemond is a three-time winner of Major League Baseball's "Executive of the Year" award (1972, 1983, 1989). In February 2011, the Baseball Hall of Fame announced that Hemond would become the second person to receive the Buck O'Neil Lifetime Achievement Award recognizing "the profound impact he has had on the game, for his baseball intelligence as a keen talent evaluator and in building winning teams, to the universal respect he has earned for mentoring generations of baseball executives, past and present." The award was presented to him on July 23. Three annual awards are named in Hemond’s honor: the Roland Hemond Award, presented by the White Sox in honor of those who are dedicated to bettering the lives of others through extraordinary personal sacrifice; the Baseball America Award, presented to the person who has made major contributions to scouting and player development; and the Society for American Baseball Research (SABR) Award, given to the executive who has displayed great respect for scouts. Hemond was the inaugural recipient of both the Baseball America and SABR awards. He received an honorary degree in Humane Letters from the University of Phoenix in July 2006 and was named an honorary member of Princeton University’s 1954 class after speaking at a sports symposium at the university in 2009. 1 2 3 4 Lingo, Will (29 July 2007). "Hemond Returns To Diamondbacks". Baseball America. Retrieved 5 November 2010. ↑ Gonzalez, Mark (22 February 2011). "Hemond named recipient of Buck O'Neil Award". Chicago Breaking Sports. Retrieved 23 February 2010.